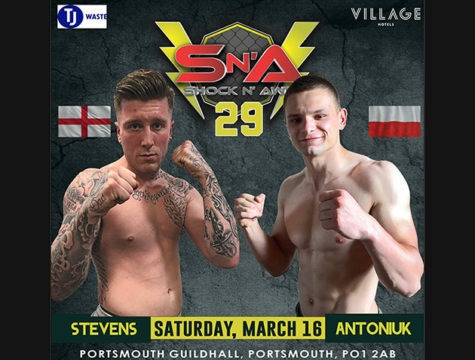 Two of the South coasts most exciting young fighters are ready to go to war on March 16th we’ve a feeling we will all be witnessing something special. Both of these young men have heavy hands and incredible gas tanks so we’re expecting to see a really fast paced fight from start to finish. Last time out Ollie Gibson was involved in an incredible battle (see fight below). He looked dominant for big parts of the fight and although he found himself in a few dangerous submissions he showed exactly why he is so highly rated by keeping composed on the way to the win. Owen Kew has improved so much over the past twelve months and he is itching to show off that skillset in front of his army of fans. 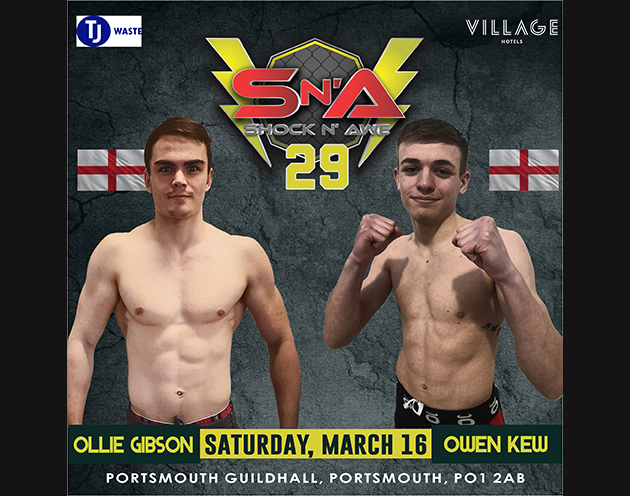 Can Portsmouth’s very own Owen Kew stop the rising star or will the belt be heading back to Mad Hatters Academy? VIP Tables (Seat 10) £900. Enjoy a VIP table with friends which is located on the stage and comes with a buffet during the interval and has it’s own VIP bar. VIP Cage Side Seats £90 each. A front row of just 20 seats around the cage just feet from the action with their own VIP bar. Encompassing the entire upstairs balcony, looking down on to the cage gives you a great view of the event. Circle Seated Tickets £35 each. Located behind the VIP tables and spanning the entire ground floor with four viewing screens at the front of the stage for a great view wherever the fight goes. Tickets are available now from HERE. Teare and Dalziel both out of Shock N Awe 29. Fenn and O’shea now meet on March 16th. 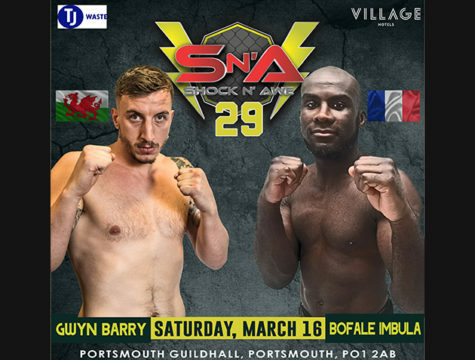 Emilov makes SNA debut to replace injured Almeida for Featherweight Title. Kilvington out of Flyweight title re-match. Green steps in on 18 days notice. Thai rules is also going to feature at Shock N Awe 29!